Villagers gathered to watch demolition work start on Newcastleton's old filling station. The demolition of an old petrol station in Newcastleton is set to fuel the rebirth of the village, residents say. 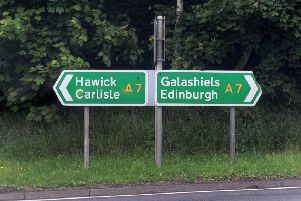 Newcastleton lost its last petrol station eight years ago, and since then, villagers have had to make a return trip of an hour and a half to Hawick to get fuel, at an average cost per household of £300 a year. That has presented a huge challenge for people in the village and the countryside around it, particularly during winter, but petrol and diesel are about to return to the village, thanks to a community-led initiative. Newcastleton and District Community Trust was set up in 2015 to improve the lives and wellbeing of everyone in the village, and getting fuel back was its No 1 priority. The trust secured funding from the Scottish Government’s land fund in 2016 to buy the old petrol station site in the village. This week, demolition of the old eyesore filling station, built in 1946, began, clearing the way for work on the new community-owned forecourt, hosting unmanned fuel pumps and electric vehicle-charging points, to start. Trust chairman Steve Hartley said: “This week marks a new page in our history. “The trust’s vision doesn’t stop with the reinstatement of the fuel. It is the start of a series of projects that the trust is undertaking on behalf of the community. All are designed to bring regeneration, jobs and prosperity back to the Liddesdale Valley. “The fuel pumps will ensure that the village once again becomes a hub for the wider hinterland as well as the community. “Our shops, cafes and pubs will all reap the rewards. “We are all looking forward to seeing the demise of the old derelict eyesore and a brand-new fuel forecourt in its stead, and the next few months will see that come to fruition. “We would like to thank all our funders and partners who have worked with us to make this happen – the Big Lottery Fund, Scottish Enterprise’s rural fuel fund, BCCF Environmental, Transport Scotland, Scottish Borders Council and all the local voluntary organisations that have contributed in so many ways to get us this far.